Day 2 – Stripes. Earned. Having a baby is a big deal, yea? Emotionally, financially and physically. Let’s start with the physical today. 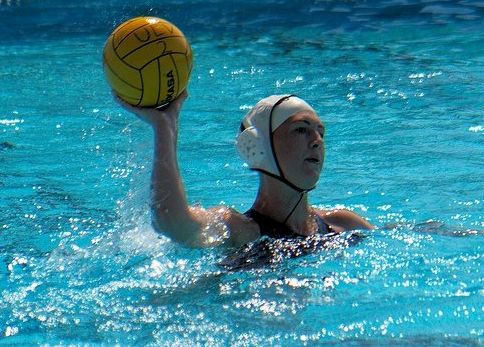 Once upon a time in a land called Orange County…I was a NCAA water polo player. The game where my jaw got dislocated. Possibly the best shape I’ve ever been in. Also, hi Hannah! Playing sports in college allowed for a unique meal plan. Basically you burned a billion calories, rarely had time to cook meals, and ended up eating a bagel and bowl of Cheerios for dinner when you got home at 10pm <–been there, ate that. Mmmm, carbs. I’ve never been a small girl. I’m 5’12” and proud of it. From years of swimming I have manshoulders. I’m cool with it. I don’t worry about my weight, heck, I don’t even own a scale. I’ve always held a healthy body image of myself. Sure, there’s been times I’ve wished this or that was different, but I’m me and I like my body. 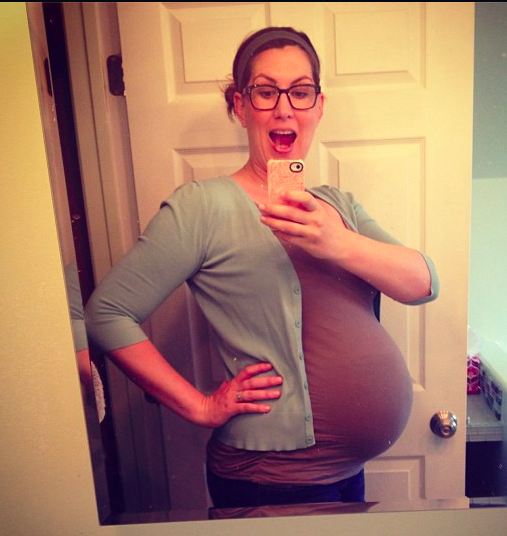 Pregnancy and body image is a strange thing. Your body is no longer just yours. It’s this very important vessel, and it’s GROWING a human. As you grow, your baby grows. Things, um, get larger. But, it’s good, right?! Your body is supporting this other life, signs of growth are to be celebrated! My pregnancy mirrored the very public pregnancies of Catherine, Duchess of Cambridge (formal title, yo!) and Kim Kardashian. It was sort of exciting to follow their pregnancy as I was going through my own. What saddened me was the constant scrutiny and commentary on their weight gain and image during pregnancy. Kim was often compared to Kate, criticized for her weight, clothing choices…eating habits. I got the “weight talk” from my OB, I know steady weight gain is ideal and healthy eating is encouraged. Gotta keep that growing bun in the oven well-fed with balanced meals! But pregnancy isn’t this one-size-fits-all deal. We’re all unique, each of our bodies look and react differently to the massive change that is growing a human. I don’t think it’s a time we should be bodyhating, but hey, it still happens. You hear a story about your neighbor’s sister’s coworker that gained 20lbs, never got a single stretch-mark and dropped all her baby-weight and more by just breastfeeding. More power to her, but that’s not the common case. 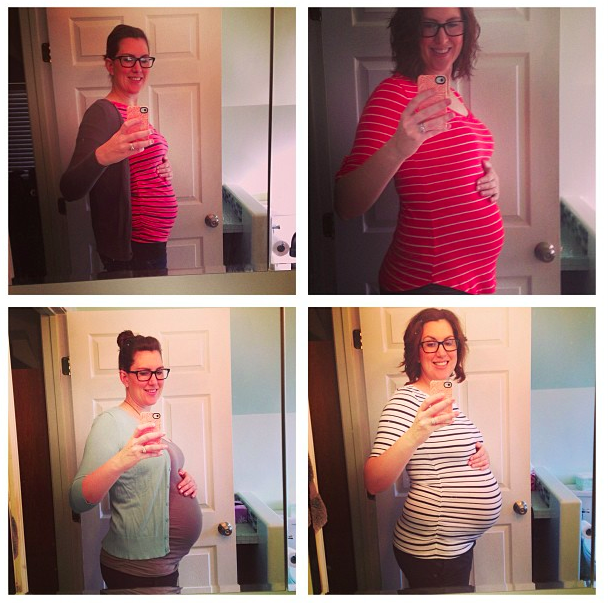 So, here I am in this 2 month post-baby body, and it’s strange. I know it’s me in the mirror, but I look so different from the girl I was a year ago. 10 months preggo + 2 months post = whoa, a year since I had my body all to myself. You know what? I’m okay with it, most days. It takes some positive self-talk, but I’m 90% good with how I look. There’s a mama tummy, and some serious stretch marks. Um, can we please talk about the stretch marks that come AFTER you give birth?! No one warns you about those! You think you’re in the clear when, BAM! You turn around one morning in the bathroom and there they are, in all their red glory, ha! It’s been said many times, but stretch marks are like a badge of honor. The outward symbol of what your body accomplished. GROWING a human. I know they will fade to a less obvious color, and things will firm up, or maybe they won’t? I do know that I’m trying to give myself a lot of grace, and plenty of time. I feel like I’m growing into my new role as a mama, while my body is taking on a new role as well. Previous postDay 1 – What’s a Mama Heart? What a beautiful sentiment. More people need to see that it is possible to love yourself just how you are. Thanks for sharing, Dell.